Laser Products, announced a strategic partnership with Northwood Designs, creators of Slabsmith. 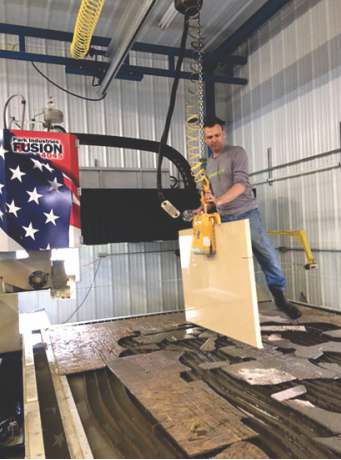 Under the agreement, Laser Products will use its industry expertise to distribute, develop and support customized applications of the Slabsmith technology for individual countertop fabricators. Slabsmith is a sophisticated slab matching and management tool that uses photographs to produce digital slabs that are highly accurate in color, dimensions, and unique slab properties. It is the only software that provides users with a robust inventory management tool that optimizes slab usage, significantly reduces waste and streamlines countertop manufacturing. Under the terms of the agreement, in addition to Slabsmith sales, Laser Products will assist customers with the requisition and set-up of the photography and studio equipment needed to optimize Slabsmith; build customized computer systems that integrate with existing corporate administrative programs; and, conduct on-site training sessions. "Partnering with Slabsmith is a perfect fit for our companies and a win-win for our customers," said Dan Louis, president, Laser Products. "Our company is well-known for manufacturing products that offer simple solutions to complicated problems. That's what Slabsmith does for slab matching and management. Combining their software with our sales and engineering expertise will help fabricators improve their business and their profits." Founded in 1994, Laser Products manufactures laser measuring equipment for the countertop, cabinet, and construction industries. They have sold over 5,000 lasers in 35 countries to more than 2,600 companies and are used by both the world's leading automated fabricators as well as smaller, manual shops. Based in Romeoville, IL, the company's products are American made using American parts in American equipment. Northwood Designs "NWD" was founded in 1986 as a cabinet making company. By 1990 cabinet making went by the wayside as CNC technology and software for the CNC industry became the prime focus. NWD's first software product was released in 1991, and by 1995 NWD software was in daily use in almost 30 countries by companies of every size. Today NWD software technology is in use by tens of thousands of companies, both as NWD products and as modules within some of world's largest CAM software companies.